If I could just welcome them, I’d do it with open arms! 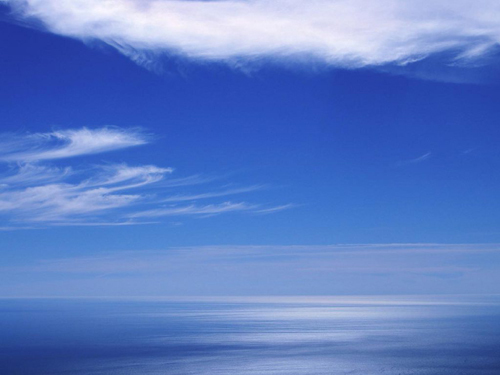 I’d so be a (blue) sky hugger! 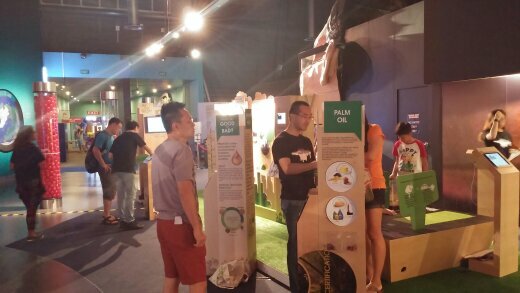 Only recently, we had an exhibition on haze at the Science Centre! Titled, Haze: Know It. Stop It. That’s where I met a passionate advocate in Xin Yi. She walked me through the exhibition and clarified a lot of my questions. Here’s what I learnt from her! 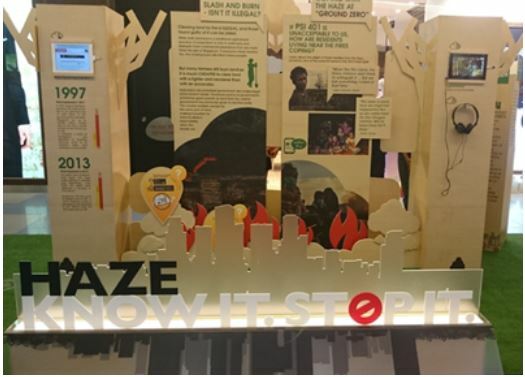 The haze exhibition was actually first featured in VivoCity in November 2014 and attracted 10,000 visitors. Given the unique crowd @ Science Centre, the exhibition was featured here during this year’s Sept school hols to reach out to more students and families. And given the ongoing haze then, it proved timely! With the reduction in rainfall and the hot and dry weather, forests burn more easily, especially those on dry peatlands. These carbon-rich peatlands produce thick haze that limits visibility and brings problems. As widely reported, several parts of Sumatra and Kalimantan have been ravaged by forest fires, with the dry season worsened by the El Niño effect. 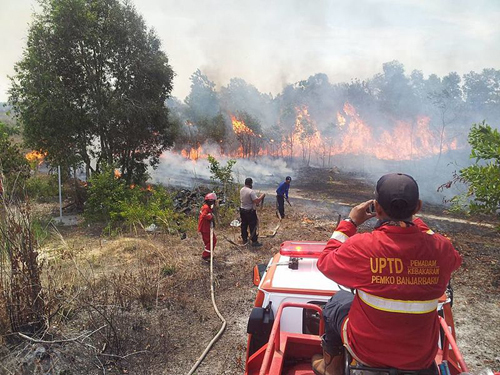 Firefighters trying to contain a forest fire in Banjarbaru, Indonesia on 6 Oct 2015. The total number of hotspots detected in Sumatra (as of 12 Oct) was 129 (check out the monthly hotspot count here). Parts of central and southern Sumatra are still affected by dense haze. Some haze that had spread westward from Kalimantan is also observed over the sea areas southeast of Singapore. Apart from flight delays and airport closures, schools were suspended in Indonesia and Malaysia. The Riau Health Agency reported over 9,000 people had suffered from haze-related diseases over the past few months. In Singapore, the air quality has dipped several times on occasion to hazardous levels (over 300 PSI). Thankfully now, there’s been tremendous relief with clearer skies and the psi dropping to moderate levels (51-100 PSI). 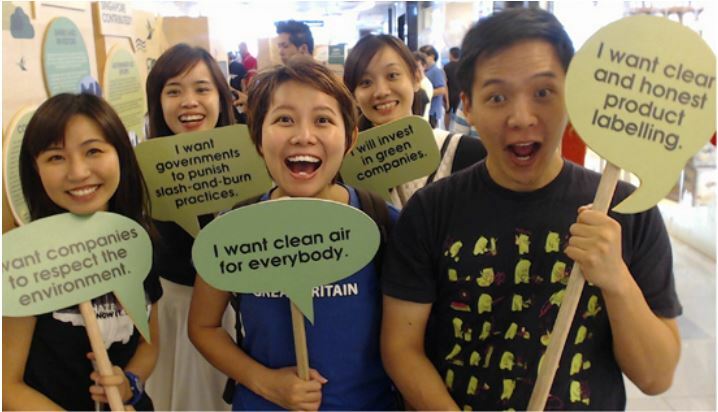 With all the haze reporting, people are now air quality savvy, with flocks tuning in to the NEA and other monitoring websites every day. They’re better enlightened not only about the slash and burn activity in Indonesia, but also of the companies headquartered in Singapore (which have operations in Indonesia such as oil palm plantations). Who let the haze out? With all the media coverages, people have come to understand this. Forest fires fuel the haze. The slash and burn fuels forest fires. Oil Palm Plantations fuel the need to clear the land*. Oil Palm Products fuel the need for Oil Palm Plantations. In truth, the relationships are a bit more complicated. Pulp and paper plantations also fuel the need to clear the land! So in essence, that’s the story being told. Empowered by this knowledge, people here have started exercising their ‘consumer power’. They’ve started boycotting oil palm products (although that’s a wide range) or paper produced by unsustainable sources. The Transboundary Haze Pollution Act passed in Parliament last year now makes it an offence to engage in or condone a conduct that causes or contributes to any haze pollution in Singapore. It’s been tricky, holding accountable the stakeholders overseas (Government officials, large corporations, smallholders, NGOs), but there’s been efforts to accelerate that. I’m not sure how sustainable these efforts are. But they’re important (in their own right) and get attention. I just hope that through all this, we’ll remain adaptable and always be a part of any solution for the problems we want fixed. To that end, SIIA has done a great job putting together an exhibition on the haze and creating continued dialogue on regional and international issues. Hopefully we’ll grow as we broaden our perspectives and explore critical issues in the world around us. For those who missed out, the haze exhibition will be displayed from October 16-18 at NEX shopping mall in Serangoon. The Singapore Institute of International Affairs (or SIIA) is a non-profit and independent organisation dedicated to the research, analysis and discussion of regional and international issues. Founded in 1962, it is Singapore’s oldest think tank. It tackles key and emerging questions of international affairs that impact geopolitics, business and our shared humanity by developing and sharing our insights, perspectives and networks. Previous articleCLIMATE CHANGEHazy with a chance of even more haze? Next articleEXHIBITIONSTry your hand at this puzzle!